Caption slip reads: "Photographer: Mack. Date 1958-11-27. Reporter: T.T. Assignment: St. Paul's Thanksgiving Day. 33/34: Very Rev. 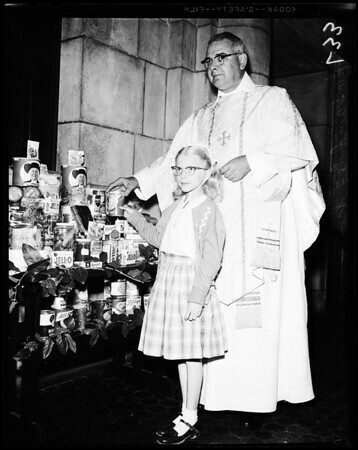 David de L. Scovil, Dean of St. Paul's Episcopal Cathedral, watches as Marlane Cuatt, 6, puts canned goods on table as Thanksgiving offering."